Vegan, gluten-free, or none of the above? 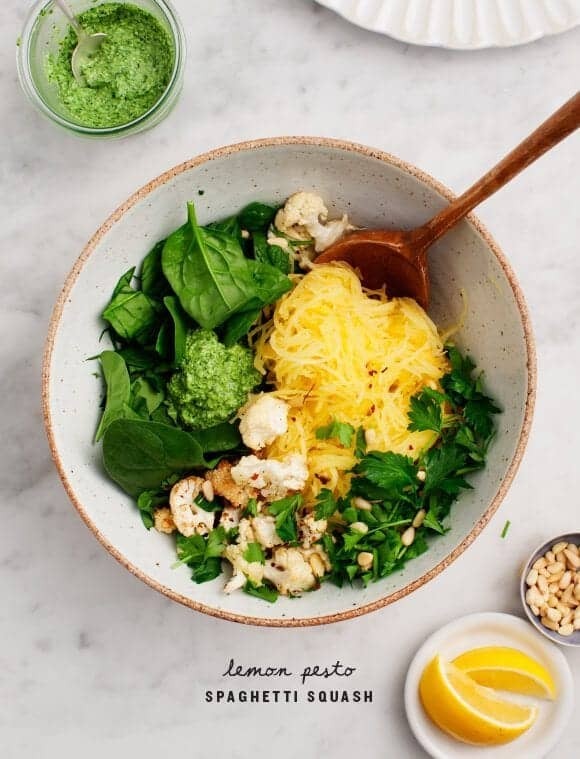 You'll love this flavorful pesto spaghetti squash bowl filled with spinach, roasted cauliflower & pine nuts. Back by popular demand – spaghetti squash! If you’ve been following for long you’ll know that I haven’t always been the biggest fan of it. But here’s what I’ve learned: it’s best to get the “spaghetti” thought out of your mind. As pasta, it’s kind of mushy. As a roasted vegetable that happens to form into little strands, it’s so delicious. Especially with a squeeze of lemon and a few dollops of pesto. And if you’re new to spaghetti squash, head over to this post to read my favorite tips for cooking it. For texture and crunch, I tossed the squash with roasted cauliflower, spinach, and pine nuts. This pesto spaghetti squash is a simple, healthy weeknight meal or vegetable side dish. Serve it like it’s pictured or mix everything together with the pesto. (It’s not as pretty at that point, but still tasty). 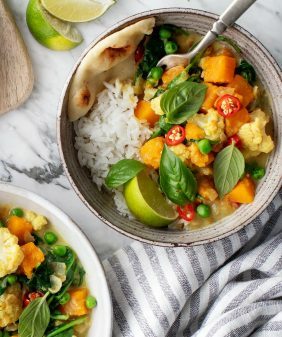 This veggie-heavy bowl is a great gluten-free, vegan weeknight dinner. 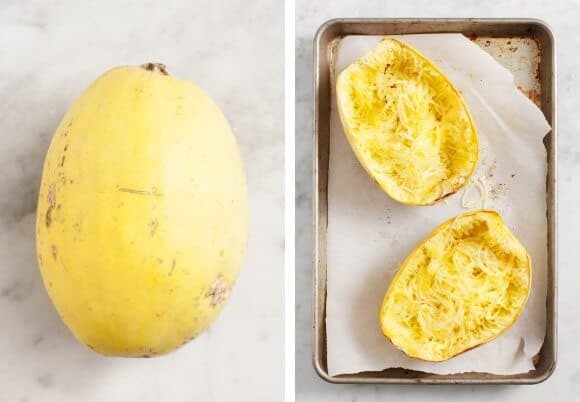 Check out this post on how to cook spaghetti squash for tips on how to prepare perfectly al dente, not-too-mushy strands. Prepare and roast the spaghetti squash according to the instructions in this post. Drizzle the cauliflower with olive oil, sprinkle with salt and pepper, and place on the second baking sheet. Roast for about 25 minutes or until golden brown around the edges. Meanwhile, make the pesto and set aside. Place the baby spinach in a large bowl. Use a fork to scrape the spaghetti squash into strands. Add the lemon juice and season to taste with salt and pepper (you can do this right in the spaghetti squash halves). 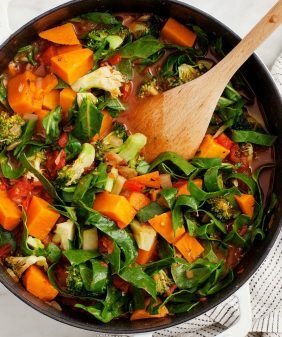 Add the spaghetti squash to the bowl and gently toss, so that the heat from the squash lightly wilts the spinach leaves. Add the roasted cauliflower, pine nuts, parsley, and a dollop of the pesto. Optional step: toss it all together so that the pesto coats all of the vegetables. Serve with lemon wedges, extra pesto, and Parmesan, if desired. Oh gosh, this was so delish! Usually I’m not a salad person because it always tastes bland and never fills me up. But this recipe was actually enjoyable to the taste. Thanks! This spaghetti squash looks wonderfully refreshing! 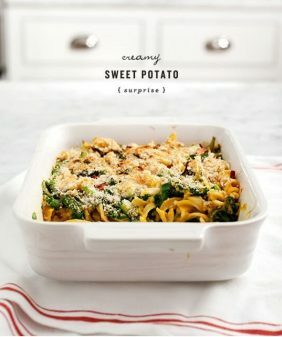 I usually see spaghetti squash recipes that have been packed with too much so this is more my style! OMG you’re so right. Have to get the idea of “spaghetti” out of your mind. It’s just like with zoodles. Only a noodle replacement in shape, not texture or taste. This looks super tasty and vibrant! Yum! I love spaghetti squash. I can’t wait to try it with pesto! I see so many recipes for spaghetti squash and this is the only one that has ever made me feel PUMPED to try it right away! What an delicious way to do spaghetti squash! This is so my kinda meal! FABULOUS. Made it last night and loved it. Used traditional basil. An absolute winner. The lemon pesto combination has me dreaming of summer!! too soon? I just tried this recipe! It was great. Thanks for this. I couldn’t wait to make this and it was delicous! Unexpected, but very tasty! I used fresh basil and tossed everything with traditional pesto. Wow..will definitely make again. Thanks for sharing! Hi Donna – I’m so glad you liked it! This looks so appetizing! And seems to be a perfect blend of tasty and healthy. 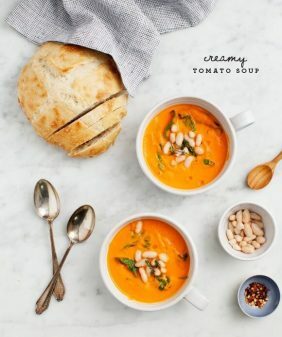 People tend to put too many flavors, and what I loved about your recipe is that it is simple and one can imagine tasting all the ingredients you’ve mentioned with every bite of the dish. Keep such recipes coming! My family of meat eaters is trying hard to clean up our diet and reset our taste buds. I have made several of your recipes thus far, and all are fantastic. This one, however, takes the cake!! Our teen girls loved it and hubby asked for seconds. Thank you for making clean eating so tasteful. This looks so awesome! I’m also wondering about that gorgeous bowl. Would you share the source? Spaghetti squash hasn’t really been my thing either, but most likely because it’s usually presented as a (very poor) substitute for pasta, and shouldn’t be treated as such. 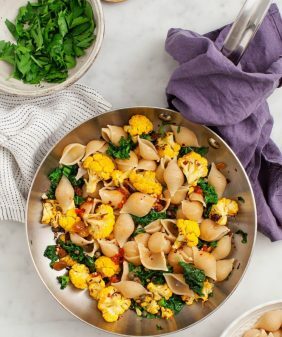 I really like the idea of punching it up with zesty pesto and some greens; can’t wait to try this. Oh how I wish we had access to winter vegetables locally here in Kauai! Oh well, I will have to live vicariously, through your beautiful imagery…..
Made this tonight for dinner. Used 1/2 baby kale and 1/2 basil plus extra garlic in the pesto. Upped the quantity of cauliflower and pine nuts because we’re big eaters. Subbed the spinach for some hardy arugula. Served it with a side of sautéed garlicky greens and some great local beer. SO good! Health on a plate and incredibly satisfying. Will make this again! Hi Katherine – yay, I’m so glad it was a winner! 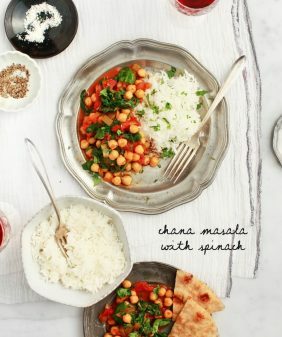 Such a nice recipes for healthy foods.. Recipe sounds delicious. I’m always looking for new creative dishes. Love that it is healthy can’t wait to try them.